At today’s House Energy and Commerce Oversight and Investigations Subcommittee hearing, “From DOE Loan Guarantee to FBI Raid: What Solyndra’s Executives Knew,” the witnesses, Solyndra President and CEO Brian Harrison and Solyndra VP and CFO W.G. Stover, invoked their Fifth Amendment right against self-incrimination in response to every question asked by Committee members. 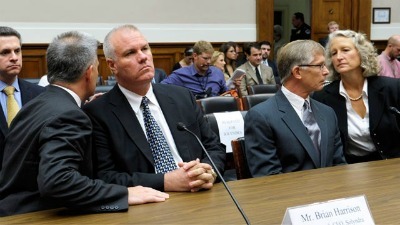 Harrison and Stover told the committee nothing about what Solyndra’s executives knew. Nonetheless, the hearing spotlighted information that can only build public support for the Committee’s ongoing investigation. Solyndra, one of the only volume solar manufacturers in the United States, continues to make excellent progress to the company’s overall annual strategic plan, while meeting the company’s technical, cost and performance milestones. The factory is ramping and Solyndra is hiring employees today, creating jobs at the company, within our primarily domestic supply chain, and through integrators and installers implementing our systems on rooftops in the U.S. and around the world. Solyndra does not publicly release quarterly results but is on track for this year. The ability to command a slight price premium as a result of substantial differentiation and product benefits continues and our cash production cost per watt is dropping rapidly at pace with the industry. The Committee also released a July 13, 2011 letter from Solyndra CEO Brian Harrison to Subcommittee Chair Cliff Stearns (R-Fla.) and Ranking Member Diana DeGette (D-Colo.) extolling the company’s successes such as the growth in revenues from $6 million in 2008 to $140 million in 2010 with revenues expected to double in 2011. It is hard to square this information with the company’s imminent collapse. At a minimum, other more pertinent information was not disclosed. In addition, the Committee released an email dated september 10, 2011 from Solyndra’s counsel pledging that Harrison would “appear voluntarily and answer the Committee’s questions.” The email references a request, honored by the Committee, to postpone the hearing so that Harrison could concentrate on managing asset sales to minimize taxpayer losses. But then three days ago, Chairman Stearns said in his opening statement, Solyndra’s counsel informed the Committee that Harrison and Stover would decline to answer questions. In their opening statements, Republican members reiterated the many unanswered questions sparked by Solyndra’s bankruptcy: Why did the Department of Energy (DOE) approve a $535 million loan guarantee to a company whose liquidity was a major concern since 2009? Did political pressure from the White House for a photo-op and green jobs PR tip the scales at DOE and the Office of Management and Budget (OMB) in favor of approving the loan guarantee? Why did DOE restructure Solyndra’s loan even though allowing the company to fail sooner would have been less costly to taxpayers? Why were taxpayers subordinated to private investors in the restructuring, in apparent violation of the law? To what extent were any of these decisions influenced by President Obama’s political ties to Solyndra investor George Kaiser? In light of the fact that the Justice Department got a search warrant for your records shortly after the unflattering emails from within the Obama administration were given to this committee, do you feel you have been unfairly targeted by the Obama administration Justice Department in order to keep you from testifying here today? Or do you believe the Justice Department’s investigation in this matter is a smokescreen, by the administration, to shield the administration’s gross negligence in giving you and possibly others questionable loan guarantees in the first place? Or do you believe it is a smokescreen for the administration’s decision to subordinate $75 million of taxpayer money against the clear meaning of the law? I believe that solar will not come into general use until a super storage battery is developed. It appears that some of the rare earth elements will be required for that to happen. They are not called rare earth with out good reason. They even are subject to special treatment in the periodic table. Unfortunately the USA is not well endowed with rare earths and the only deposit I know of is in Californis. It appears that China has the largest known deposits in the world which should enable them to lead the world in solar development. Elon Musk’s Solar City just blew out of the DOE Loan program because they cooked the books and bought influence just like Tesla. Steve Spinner, Matt Rogers and Lachlan Seward at DOE manipulated the process to ignore Tesla’s fake financials because Tesla bought their loan from the White House, the investigations will prove this and Tesla will be history. Previous post: Blame China for Solyndra’s Downfall?